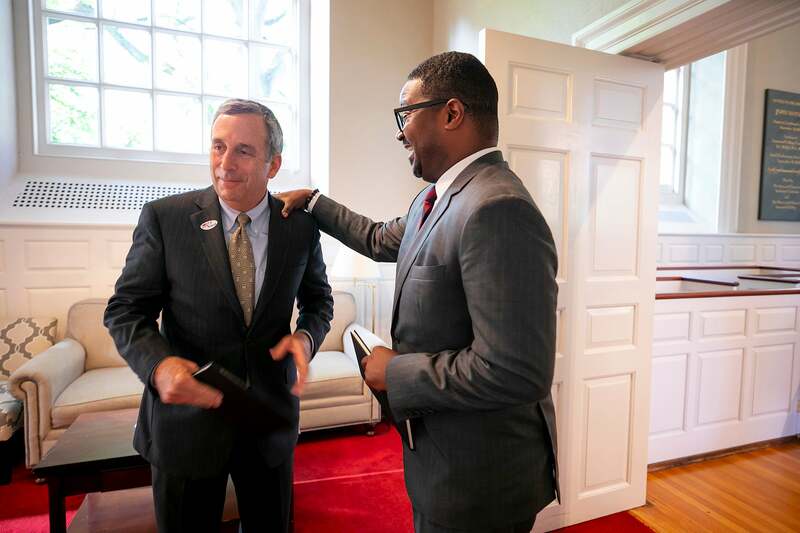 Contemplation and reflection were themes of Harvard President Larry Bacow's remarks at Morning Prayers at Memorial Church. “As we gather today in this sacred space at the heart of our campus, I hope each of us is reminded of the importance of pausing to consider life, not in retrospect, or in prospect, but as it is actually being lived,” said Bacow, speaking at the first Morning Prayers of the academic year at Memorial Church’s Appleton Chapel. Bacow greets Florence Ladd, retired director of Radcliffe Bunting Institute and frequent attendee of Morning Prayers, as Walton talks to people following the ceremony. The tradition of Morning Prayers dates to Harvard’s founding in 1636. The brief weekday services during the fall and spring terms consist of songs, sacred texts, and secular readings and remarks, and guide members of the campus community through 15 minutes of contemplation to begin the day. The themes of community and reflection were echoed in the service’s music. Choral Fellows of the Harvard University Choir sang “There must be a beginning to any great matter, but the continuing unto the end until it be thoroughly finished yields the true glory.” Attributed to a quote from a letter by Sir Francis Drake, the words were part of “The True Glory,” a new composition by the church’s composer in residence, Carson Cooman ’04. Students enter the chapel to hear President Larry Bacow. The hymn “Joyful, Joyful, We Adore Thee,” set to the “Ode to Joy” of Beethoven’s Ninth Symphony and sung at the service’s close, also evoked community spirit. The Rev. Jonathan Walton, Plummer Professor of Christian Morals and Pusey Minister in the Memorial Church, called to mind the words of Jewish civil and ceremonial law as he brought the service to an end.